Let’s face it, Turkey is a foodie’s dream. You literally cannot walk ten feet without running into street food or a hole-in-the-wall cafe with only two tables. Even on the public transit boats from the European to Asian sides, (whose trips take 25 minutes) a man comes around selling tea and sandwiches. Istanbul especially has an extremely varied and unique cuisine because of the city’s rich history. Food here is sometimes Mediterranean, sometimes Anatolian, and sometimes… well no one really knows where it came from. If you’re only here for a short time, these are the must eats to get just a taste (pun intended) of the fabulous Turkish cuisine. 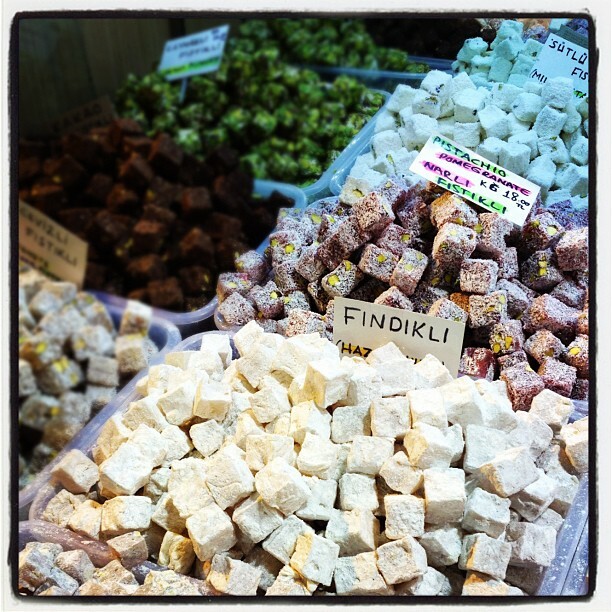 If you’re like me, then Turkish Delight was a mysterious sweet you read about in the Lion the Witch and the Wardrobe before coming to Turkey! There are endless varieties of this jelly-like sweet with flavors ranging from hazelnut to rosewater. If you want to try out your bargaining skills, head to the Spice Bazaar, but if you’re willing to shell out some extra lira, the famous and historic Hacı Bekir on İstiklal Avenue is the place to go. And don’t be shy about trying the flavors before you buy! In Istanbul, you cannot escape this bagel-like bread covered with sesame seeds. This staple is best enjoyed in the morning either from one of the bright red carts on the streets, or in Simit Sarayı with some beyaz peynir (a Turkish soft white cheese). This sliced meat can be found in other parts of the world, but it was a Turk who made it spin. Döner kebab is sliced off of cone-shaped stacks of meat and served on pita bread. Traditionally, the meat is lamb, but beef and chicken are also popular. Follow your nose to the top of Istiklal Avenue and get it on the street or stop by Beyti Restaurant on your way to or from Ataturk Airport for a more upscale version. One piece of advice: don’t think about the calories. This savory pastry is made by stuffing meat, vegetables, or cheese between layers of buttery phyllo dough. It sounds simple, and that’s because it is - simply delicious, that is. Aslı Börek is a good chain with a wide selection. You can find one in Taksim on the side of Gezi Park. Dolma in Turkish just means stuffed. And in Turkey, if you can cut a hole in a vegetable, you can stuff it with rice. The rice mixture is unique in Turkey because it includes mint, cinnamon, currants, and a bit of sugar. Try the stuffed peppers (biber dolma) they’re the most popular! While exploring the neighborhood of Karaköy, stop by Namli Gurme to sit down for some traditional dolma or just grab a bunch for take-out!